A pair of (two pair in stock) antique French Napoleon III period painted chairs circa 1870 found in a stylish house near Nice. Please notice the terrific architectural back to this set of six French painted chairs topped with an open pediment flanking an urn. This motif was especially popular during the reign of Louis XVI. The seat has a slight bow front shape and the front two legs feature a dramatic turned and tapered leg. It is interesting to see the back legs also possess a sense of drama with their elegant curve. We have two pairs and are offering them by the pair at the listed price. They may also be purchased as a set of four at two times the listed price. These chairs have been custom upholstered in Belgian linen that provides a handsome contrast to the painted finish. 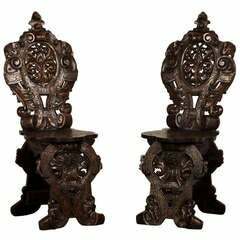 Pair of chairs in ebonized wood. Carved wood with flowers. France, circa 1880. In good condition. Petite not restored chair, as authentic as you see it on the photos. 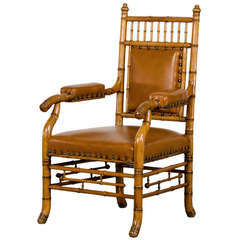 Pretty carved details, beautiful upholstery, can be changed by the customer's wish. Amazing side chair.